A recent study in the Journal of Shoulder and Elbow Surgery has validated a MRI technique to accurately measure fat fraction in rotator cuffs that may displace the longstanding Goutallier classification “gold standard” and help improve assessment. Fatty infiltration is a significant factor relating to clinical decisions on management of rotator cuff tears. When rotator cuff muscle fatty infiltration is absent, most rotator cuff repairs are successful. However, when fatty infiltration is advanced, the majority of cases result in recurrent tear or failure to relieve symptoms. Fatty infiltration can occur in the muscle of the rotator cuff after tendon tears. This degenerative change can impact the muscle’s ability to heal if additional surgery is performed. Therefore, accurate evaluation of fatty infiltration is important if additional surgery is being considered. Assessment of fatty infiltration is challenging for radiologists, according to Sonia Lee, M.D. of the Musculoskeletal Quantitative Imaging Research Group of the University of California- San Francisco’s Department of Radiology and Biomedical Imaging. Goutallier classification, a semi-quantitative 5-point scale subjective evaluation using CT or MRI imaging, represents the gold standard for evaluation of muscle fatty infiltration. However, the interobserver reliability is limited, especially in the mild to moderate infiltration where surgery may or may not be beneficial. Dr. Lee and colleagues conducted a study to use a chemical shift-based water-fat separation MRI technique called IDEAL to evaluate the association between rotator cuff fat fraction and severity of tendon disease. Their study of 182 patients determined that a MRI chemical shift IDEAL sequence is more accurate and reliable than the Goutallier classification. For the study, the IDEAL sequence was added to non-contrast shoulder MRI scans of 207 consecutive patients with no prior history of shoulder surgery between June 2011 through November 2013. Oblique coronal, oblique sagittal, and axial plane intermediate-weight fat-suppressed FSE sequences were used for tendon disease assessment. Tendon disease for the rotator cup was categorized into five categories based on severity. Full-thickness tears were classified in size, and retraction was recorded. All studies received a Goutallier classification. In addition, descriptive statistics were acquired for gender and age, height/weight/body mass index (BMI), and supraspinatus muscle fat fraction. The researchers categorized tear size, tendon retraction, age, BMI and symptom chronicity as independent variables. Tendon retraction was highly associated with fatty infiltration in rotator cuff muscle. Supraspinatus muscle fat fraction increased with tendon retraction, and it was significantly higher in medium sized tears than in subjects with no tears. There also was a large increase in fat fraction between medium tears and large/massive tear subjects. Tear size was independently associated with an increasing percentage of intramuscular fat. The largest increase was seen between medium-sized and large tears. BMI was a significant independent predictor of fat fraction, especially in supraspinatus and subscapularis muscles. Age and gender also had an influence in predicting fatty infiltration. However, symptom duration did not. In summary, the IDEAL technique was a significant improvement over the Goutallier classification in its diagnostic reliability, with absolute precision errors of fat fraction ranging from 0.6% to 1.0%. Lee S, Lucas RM, Lansdown DA, et al. 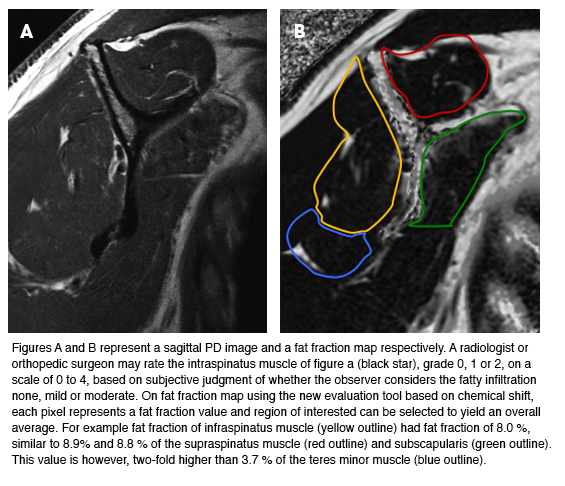 Magnetic resonance rotator cuff fat fraction and its relationship with tendon tear severity and subject characteristics. J Shoulder Elbow Surg. Published online March 26, 2015. New technique improves rotator cuff tear assessment. Appl Radiol.